When growing cannabis for the first time, you want the process to be as simple and easy as possible. But buying marijuana seeds for the first time can feel like decision overload. With so many different strains out there, and so many suppliers, how do you even begin to choose? Which online seedbanks are reliable and reputable? How do I germinate them successfully and not waste my cash? 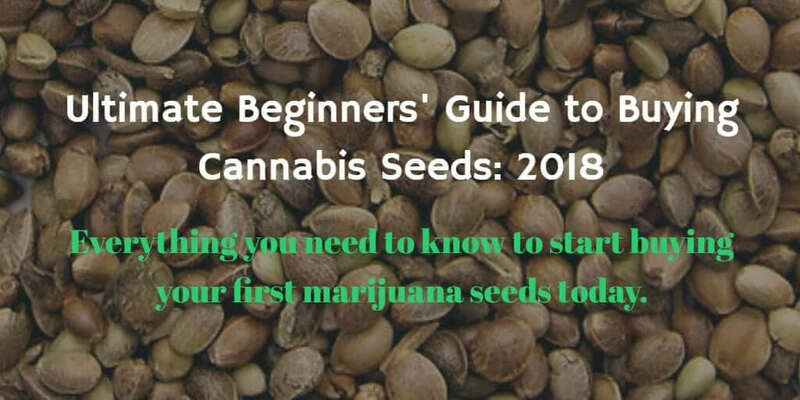 We’re here to help—with this Ultimate Beginners Guide to Buying Marijuana Seeds 2018. Read on and we’ll show you exactly how to choose and buy marijuana seeds and get them sprouting even if it’s your very first time. There are many advantages when it comes to growing cannabis from a seed. Some find the experience of growing their own plant from a seed to flower a very rewarding experience. Others enjoy having control over the growth and nutrition of their plants. No matter the reason, it is very important to choose the highest quality cannabis seeds. To do this, you need to know the different varieties and strains of seeds that you can purchase. You also need to be aware of any problems that may occur when ordering seeds online. Using seeds produces a tap root, which anchors the plant into the soil. Clones do not produce this, making them less sturdy and unable to absorb as much water and nutrients. The tap root ensures a healthier plant. Seeds come in more varieties, giving you much more choice and control over the end product. Plants grown from seeds produce higher yield, as they experience less stress. Risk of disease or pests is reduced. Seeds are a great way for beginners to start growing cannabis since they can be purchased discreetly online. This auto-flowering feminized seed from MSNL seedbank is one of the most popular strains. It is known as a fantastic strain for novice growers. It is easy to grow, very potent, and produces a high yield. The flowering time of this dreamy plant is only 8-10 weeks. This is a hybrid of indica and sativa to provide you a balanced high without anxiety. This will give you a sweet, fruit flavor with a classic hash taste as well. Northern Lights is not known for being an especially potent hybrid, but it is a classic and easy to grow. This particular one from Amsterdam Marijuana Seeds is Northern Lights XTRM and is an auto-flowering feminized seed. A cross of 11 different genetics, this is the balance of the most desirable traits. This plant is also highly recommended for medicinal use due to its high THC and CBD content. The high yielding strain will begin to flower within 8-9 weeks so you can enjoy your perfect plants in no time. Lowryder is a hybrid that was created to be very easy to grow, perfect for beginners. This seed grows true to its name as it stays short in height. This makes it compact and very discreet. It grows quickly, flowering within 8 weeks and is known to be very stable and reliable. This is a cross breed of two well-known plants, Williams Wonder, Northern Lights No. 2 and a lesser known breed, a Mexican Ruderalis. Lowryder is indica dominant, with an earthy taste that gives you a relaxing full body high. This popular hybrid from Nirvana is very potent. It is a combination of Skunk #1 and Skunk Special. This indica dominant, feminized seed, produces large flowers with a high yield. It doesn’t need anything more than basic care to ensure successful growth. The flowering time is 8-10 weeks. This strain produces a relaxed high that can be used to help reduce stress and anxiety. It has traditional earthy aromas of potent skunk. This seed was created using genetics from one of the most intense sativas to be grown and a Cannabis Cup winner, White Haze. This auto-flowering, beginner friendly version has a flowering period of 6-9 weeks with a decent yield. White Haze Auto has a sweet and spicy aroma and is very popular for medicinal use. It is often used to treat chronic pain because of the euphoric and relaxing high that it produces. Green crack is great for a novice looking to try a legendary strain. These feminized seeds will grow easily. It has a flowering period of 7-9 weeks and is indica dominant. When consumed, Green Crack will provide you with tons of energy, hence the name, with a sweet, citrus, and mango perfume. This strain is perfect for the daytime when you need a boost of energy. It is also great if you are looking for something to treat chronic fatigue. Wonder Woman is a popular strain that is great for beginners. It is a cross between Super Skunk and White Widow. This easy to grow hybrid will flower within 8-10 weeks and produce easy to trim buds. It is also very high yielding. Wonder Woman is indica dominant and high in THC. Rich in flavor, you’ll taste the traditional skunk while experiencing a long lasting, happy and euphoric high.